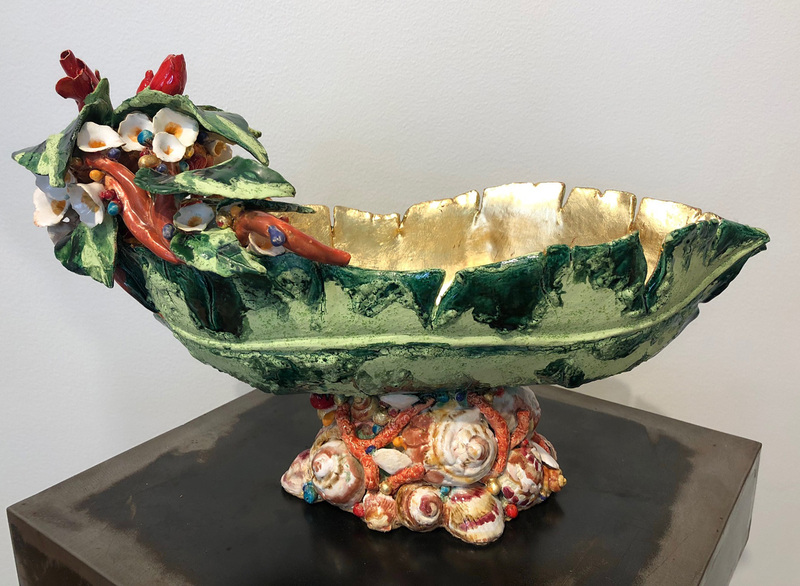 Influenced by Italian and European ceramics (Majolica, Capodimonte ) , George Alexander’s richly glazed and three dimensionally expressive work takes clay to new horizons. 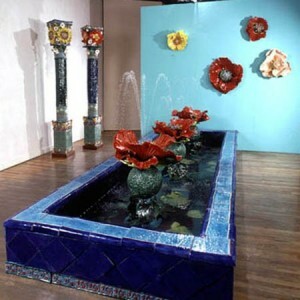 Called by many “..the Chihuly of clay”, George’s work is constantly evolving into new forms and images. Pushing the boundaries of the medium, his unique interpretations are kindled by artistic influences as diverse as Japanese and Persian textiles, impressionist paintings and primitive and tribal pottery. Working with contrasts and balances, George fuses the glossy sophistication of European traditions with the raw and essential elements of the clay. 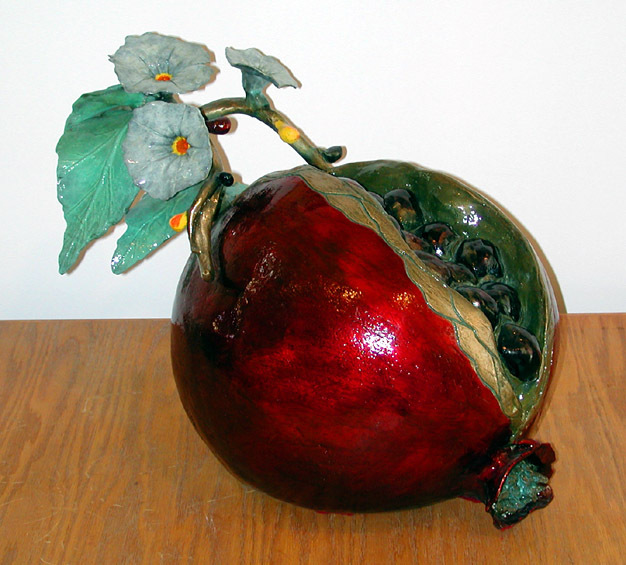 His ceramic art is a narration celebrating life’s vitality. It is imbued with a sophisticated wit and humor. George Alexander’s new series continues this exploration. Brilliantly colored giant fruits, monkeys, turtles and assorted animals cloaked in blankets of spectacular flowers have materialized from the land of his bountiful imagination. This series is continually unfolding and is highly prized. Constructed in a high fire sculpture body that George developed after years of experimentation, the work’s durability belies its implied fragility. George Alexander is uniquely adept at translating your specifications into highly original work with his signature style. 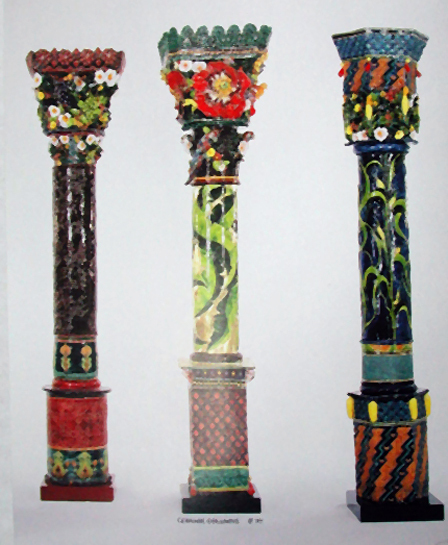 Born and raised in Mississippi, George Alexander received his BFA from the University of Mississippi at Oxford; he continued study with post graduate work in Italy and Spain and later with David Leach, Paul Soldner and Charles Counts. 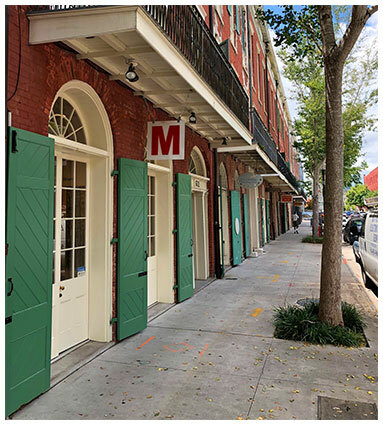 After a thirty plus year absence, he has returned to New Orleans to live and open a new studio. In the fall he will begin to offer intimate workshops for groups of 3 to 6 students at a time. If interested, please contact the gallery for details. Commissions are accepted. Additional information upon request.